Round Robin and IO Operations Limit of 1 is now default in ESXi for the Pure Storage FlashArray! This means that you no longer need to create a custom SATP rule when provisioning a new host or adding your first FlashArray into an existing environment. What this is saying that all Pure Storage FlashArray devices will be configured by default to use Round Robin and an IO Operations Limit of 1. For a quick refresher the IO Operations Limit is how often, for a given device, ESXi switches logical paths. We recommend setting this to 1 due to primarily path failover time is improved by quite a bit when this is set low. So once you are on these release you no longer need to worry about this any more. Yay! So what does the upgrade look like, and what if you have an existing rule? Well let’s first look at it for a fresh upgrade with no manually created rule. So let’s upgrade! 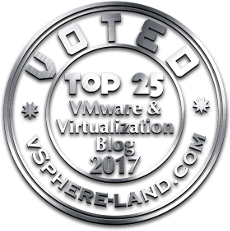 I have my update on one of my VMFS volumes, but you can do it directly from VMware’s website too of course. esxcli software vib install -d "/vmfs/volumes/Template/update-from-esxi6.5-6.5_update01.zip"
Or with PowerCLI with one of my scripts or your own. esxcli storage nmp satp rule list |grep "FlashArray"
Now let’s run the upgrade on this host. You can see two rules now, my original one and the new one. You can tell the difference between the two by looking at the “Rule Group” column. The one you created in the past will be of type “user” and the new one is of type “system”. Finds any host with a system rule for the FlashArray. Looks on that host for any user FlashArray rule that is the same as the system one and deletes it. If the FlashArray user rule is different it skips. For more info on conflicting configurations on rules, read on to the next section. NOTE: You don’t have to delete old rules. This is really more for keeping things clean to look at, and removing old unnecessary configurations. What about a host with a user rule that differs from the new default? Like let’s say it has an IO Operations Limit of 5 set? How does the upgrade work. Let’s take a look! So in this situation I have a “user” rule that indicates an IO Operation Limit of 5, which conflicts with the new default rule that configures the FlashArray volumes with an IO Operations Limit of 1. So after upgrade who takes precedence if the user rule is not deleted first? So let’s update to 6.5.1 and reboot. We now have two rules, one is the “system” rule which says IO Operations Limit should be 1 and a “user” rule that says IO Operations Limit should be 5. So how are the devices configured? esxcli storage nmp device list |grep "iops"
So what this means is this: “user” rules override system “rules”. So there is no need to be concerned during an upgrade if for some reason you have a conflicting rule. ESXi will apply your custom user rule to all FlashArray storage and it will ignore the system rule. One less thing to do now for VMware and the FlashArray! always appreciate you staying on top of this and posting the info….many thanks!!! !